Aasaanjobs’ fund-raising journey has been a bit different so far from most impact start-ups. Last January, the Mumbai-based company picked up $1.5 million in seed capital from Inventus Capital Partners and IDG Ventures India. Both are mainstream venture capital firms and generally don’t back businesses that focus on consumers at the bottom half of the pyramid. This week, the two firms increased their investment when the company raised $5 million in a Series A round led by Aspada Advisors, the venture capital firm backed by Soros Economic Development Fund. Inventus and IDG Ventures don’t classify Aasaanjobs, which runs an online jobs portal for blue- and grey-collared professionals, as an impact investment. In the long term, that could be a good thing for the company. 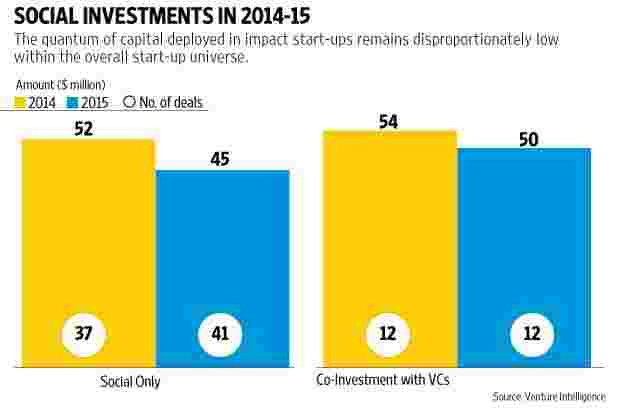 The quantum of capital deployed in impact start-ups remains disproportionately low within the overall start-up universe. Over the past seven years, more than 300 impact start-ups in the country have raised about $1.6 billion. On the other hand, non-impact start-ups garnered venture capital worth $1.8 billion in 2015 alone, according to data compiled by Chennai-based research firm Venture Intelligence. Impact start-ups find themselves on the sidelines of the funding boom that has been underway in India over the past few years for a couple of reasons. One, the impact tag itself hasn’t been particularly helpful for such companies because of the perception that ‘impact’ doesn’t necessarily imply profit and scale-oriented businesses. As a result, mainstream venture capital firms haven’t been enthusiastic about bringing in capital, whether at the seed stages or follow-on capital at the Series A and B stages. Last year, for instance, out of the 90 early stage impact investment deals reported, only 12 involved mainstream venture capital firms (see chart). The smattering of impact deals reported so far this year continue with that pattern. There have been eight-odd deals since January and except for Aasaanjobs all of them have been done by impact investors. Mumbai-based Greenway Appliances, which makes biomass cooking stoves, has just raised $2.5 million in a Series A funding round from Acumen, Genpact founder and former CEO Pramod Bhasin and Asha Impact founder Vikram Gandhi. Affordable skills development services provider Avanti Learning has received $5 million in a follow-on round from the Michael and Susan Dell Foundation. And this week, Bengaluru-based background verification platform BetterPlace raised a $1 million seed round from Unitus Seed Fund. The second reason that impact start-ups lag their mainstream counterparts is that impact investors themselves are constrained for funds. New Delhi-based Lok Capital, among the larger impact venture capital firms active in the country, currently has barely $100 million in funds under management. Impact funds such as Lok, Aavishkaar and Acumen depend primarily on global development finance institutions (DFIs) and philanthropic corporate foundations for funds. While overall impact investing activity has grown over the years, both in terms of number of impact venture capital firms in the market and start-ups, the allocations from DFIs and foundations have not grown proportionately. This is a problem that the local impact investor community is currently trying to address through the recently constituted Impact Investment Council. In late January, the council, which is based in New Delhi and represents the country’s 30-odd impact venture capital firms, submitted a list of suggestions to the government for stimulating impact investing activity in the country. The key suggestions include a review of the regulatory guidelines for social or impact venture capital funds, extending priority sector lending to social enterprises and increasing access to external commercial borrowing for impact enterprises. The government’s intervention, when it comes, may help impact funds to access more capital and that will be a big boost in itself to the sector. However, as long as mainstream venture capital investors continue to keep their distance, impact start-ups will continue to be constrained for serious capital. That’s a problem that needs a more creative solution and one that will not be easy to find. Snigdha Sengupta is the founder of StartupCentral, a digital news and analytics platform focused on venture capital. She also periodically contributes stories on venture capital and private equity to Mint.